In order to promote good sportsmanship, the Intramural Program has upheld a sportsmanship policy. It is the responsibility of the team and players to make sure the game atmosphere is friendly and fun to both staff and fellow participants. The sportsmanship rating will be determined by game officials and will include behavior before, during and after each contest. Each team will receive a letter grade after each game. A penalty will be displayed during contests to warn and/or eject individuals, teams or spectators. Ejections occur when an individual receives 2 minor infractions or 1 major infraction. Any team and all players on that team receiving an F rating will be suspended from further play until meeting with and being reinstated by the Sports Director. **All sportsmanship-related incidents may be referred to the Office of Student Conduct. An ejection policy has been implemented in our Intramural Sports Program. 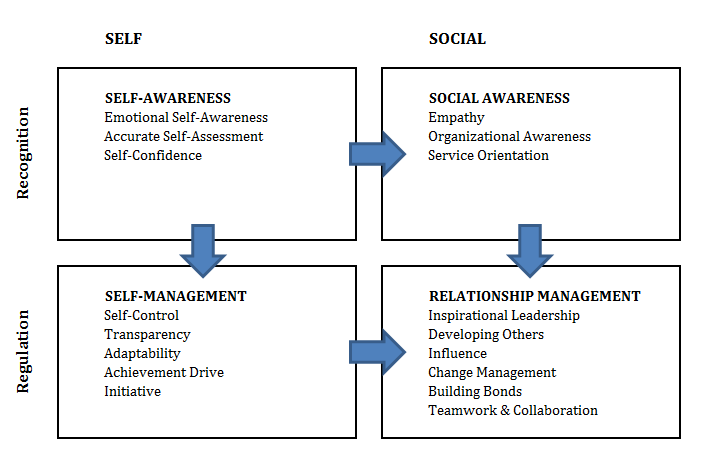 This policy is related to the Components of Emotional Intelligence as seen in the chart below. Discuss the association between Emotional Intelligence and the ejection. What was the impact of your ejection on your community and on yourself? What intentional actions or steps will you take to prevent negative interactions in future participations with our program? The only way to submit this reflection paper is to Submit the Petition for Reinstatement Reflection Paper by following the link to the form. Only online submissions will be accepted. Educated by the recommendation from the Student Advisory Board, the Intramural Sports Administration will make the final decision upon reinstatement. The Intramural Sports Program and the Student Advisory Board require a minimum of 4 weeks to review petitions once they are submitted. The decision to complete this request for reinstatement is completely up to the ejected participant. If you have questions regarding your ejection, please contact the Intramural Sports Office at 806-742-2945 or by email at Intramurals@ttu.edu.